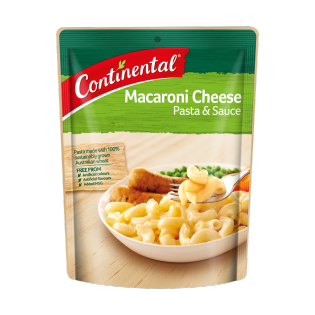 This Macaroni Cheese Pasta & Sauce is the ultimate comfort food and a hit with children every time. It’s tasty, very cheesy, simple to cook and versatile. Serve as a Mac n Cheese snack or use it as the perfect accompaniment to a grilled chicken dish or juicy steak with some roast vegies on the side. Pasta & Sauces are available in a standard size or a value pack. Cooking time: 10 minutes Stove top - for best results 1) Bring ¾ cup (190mL) Lite milk, 1 cup (250mL) hot water, 2 teaspoons Flora Salt Reduced spread and Pasta & Sauce pack contents to the boil, stirring 2) Simmer, uncovered for 10 minutes, stirring regularly until sauce thickens and pasta is cooked Microwave (900W) – cooking times may vary 1) Combine ¾ cup (190mL) Lite milk, 1 cup (250mL) hot water, 2 teaspoons Flora Salt Reduced spread and Pasta & Sauce pack contents in a microwave safe bowl 2) Cook uncovered on HIGH for 10-12 minutes, stirring 2-3 times. Stand 2 minutes before serving Cook a complete meal in 15 minutes. Go to our website for delicious one pan meal ideas.